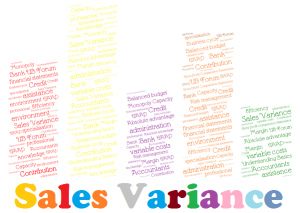 Sales Variances Sales variance analysis helps management to determine the.. Sales variance analysis helps management to determine the cause. it control the variances and it guides management to move towards a better, profitable and informed management of the resources. Now there are different types of variance analysis. Which help management on a different level in analyzing the sales situation. At level one, we determine the static-budget variance. The main focus of this budget is to determine the difference between actual results achieved and the static-budgeted amounts. At level two, we use the help of flexible-budget variance. In this type of budget we determine the variance between the actual results achieved and the corresponding flexible budgeted amounts determined on the actual output quantity. The difference between the static and the flexible budget is the sales volume variance, as the flexible budget is calculated on the actual output achieved. Where as static budget is determined on a preplanned activity level. So, the sales variance analysis shows the effect on the budgeted contribution margin of the difference between the actual quantity of units sold and the budgeted quantity of units sold. At third level of sales variance, we determine the sales quantity variance and the sales mix variance. In sales mix variance we calculate the difference between budgeted contribution margin for the actual sales mix and budgeted contribution margin for the budgeted sales mix. Whereas, in sales quantity variance we calculate the difference between budgeted contribution margin based on actual units sold of all products at the budgeted mix and contribution margin in the static budget (which is based on budgeted units of all products to be sold at budgeted mix).